Whether your stay is business or pleasure the Hampton Inn Bowling Green OH hotel will make your stay in Ohio a positive and memorable experience. 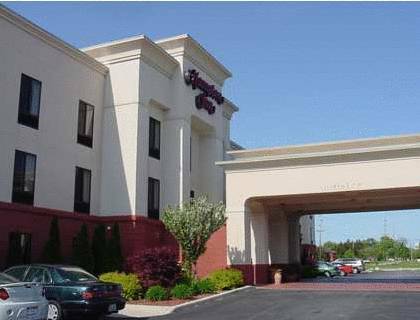 This Hampton Inn hotel is conveniently located off I-75/Exit 181 and directly across the street from Bowling Green State University. The Hampton Inn Bowling Green is a luxurious hotel that features an elegant two story Romanesque motif and makes you feel like royalty. Warm up by our fireplace or indulge in our playing grand piano. This unique Hampton Inn hotel will make you feel like it is your home away from home while in Bowling Green Ohio. The Hampton Inn Bowling Green hotel in Ohio offers complimentary amenities that include high-speed internet access in each room and wireless internet access in our public areas. In Bowling Green this Ohio Hampton Inn hotel also offers local phone calls a billiards room exercise facility indoor swimming pool and whirlpool oversized work desks with ergonomic chairs 2 phone lines and lounge chair with ottoman. On top of all that add the Hampton Inn hotel **On The House Hot Breakfast** which features hot items daily including sausage eggs French toast waffles sausage gravy and also has a variety of assorted cereals bagels muffins fruit cocktail breakfast breads and many more. At the Hampton Inn hotel in Bowling Green Ohio we save our guests money so enjoy the discounts you can receive and the Ohio hospitality at these local restaurants El Zarape Easy Street Cafe Junction Bar - Grill Sam B*s or Trotter*s Tavern. We love having you here at the Hampton Inn Bowling Green OH hotel in Ohio. - Bowling Green St. Univ. - Wood Co. Historical Ctr. - Tochiq Fuji American Mnfc. Perhaps the most famous bathroom fixture in American history. It belonged to the captain of a battleship that started one of our lesser wars. ~23 miles from Bowling Green. ~37 miles from Bowling Green. ~60 miles from Bowling Green.